I am always going on and on about what a great value I feel the recent G.I. Joe figures are, given all of the astonishing accessories that each figure includes. When you look at something like a Justice League Unlimited figure, at the current $9.99 price point in Target - where you're lucky if you get a single cartoony accessory, the value of the $7.99 Joes really shines through. Now, granted, they're going for a different style and concept with those JLU figures, so no offence to Mattel, but money is money, right? 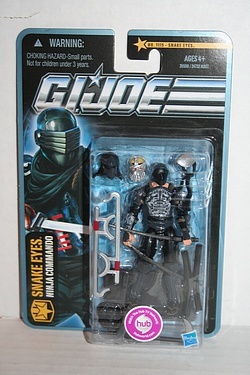 Inkeeping with my keen observance of these great pack-ins with the Joe figures, I'm definitely digging 'Temple Guardian' Snake Eyes from the newly released Wave 6 of figures in the Pursuit of Cobra line. 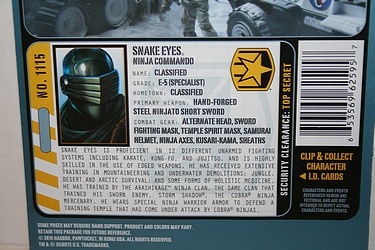 Something amusing, though, is the care with which they enumerated these myriad accessories on the lengthy bio card for SE this time around, going so far as to mention the 'alternate head' as part of his Combat Gear. While I'm all for completeness, I was a little jarred by the step outside of the 'believable' nature of the cards, as this seemed to speak directly to a feature of the plastic toy rather than the suspended-disbelief action hero. Well, maybe I'm just being picky on this Sunday evening as I type this, but I felt I had to at least mention it! Click the image below to check out this latest version of ol' Snake Eyes, and be sure to read the (not really) controversial bio!